They look pretty nice…are they that color or did the flash fade them out a bit? The cards are basically that color and design. The flash makes it look the card look brighter than it is though. That’s extremely expensive for 500 single sided cards. I use a local company here in Minneapolis called Triton Printing. They offer 1000 single sided cards for $40 and they do extremely good work. The few times something hasn’t turned out right, they go out of their way to fix the problem in a timely manner. http://www.tritonprinting.com is their website, but I always just call them up and talk to one of the many great people working there, they always help me out! Thanks for the tip! I actually got my money refunded because I called Vistaprint and said I wasn’t happy with the way the cards came out. So technically they were Free. Something to keep in mind for anyone who orders from Vistaprint. I will look into Triton Printing next time I need business cards. I have also heard good things about Moo and Smart Levels. Thank you for the tip and commenting. Are people blindfolded shopping at vista print? People think that they get a good deal with free business cards but the reality is that they work for vistaprint just by handing out cards with their logo.. that’s a true win for vista print! Overall they are really overpriced, like you have paid $40 for 500 filmsy business cards when you can get for the same price 5000 cards on thick 14pt cardsock if you just browse around. I am going to get a new set of business cards with a better design soon. 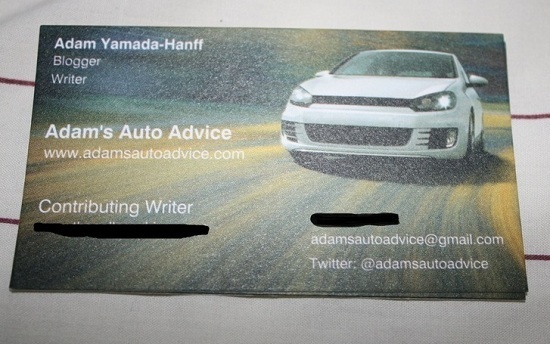 I’ve changed my Twitter handle, email, and have a other websites I want on a new business card. Next Next post: Safety Scholars announces Winners!